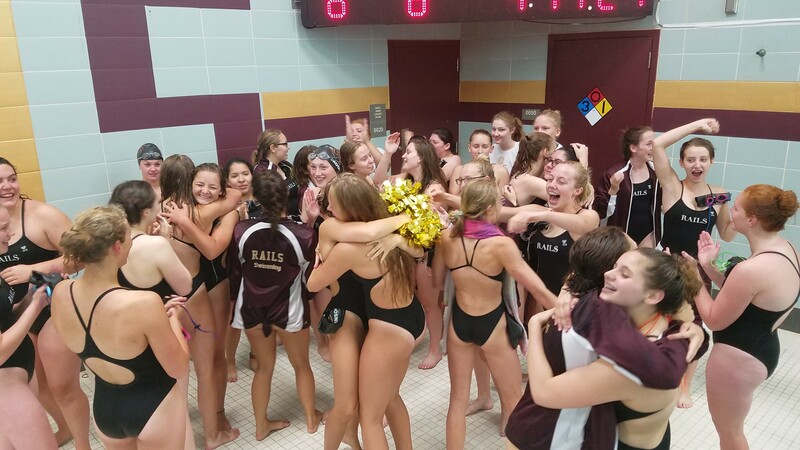 Rails Swimming and Diving team won 96-90 over the Waukee Warriors in a historic win on Thurs., Aug. 23. The victory marks the first time that the Rails have beat a major suburban school. Waukee has finished top four in the statewide power rankings three straight years. The meet opened with a close medley relay race. Ella Worth (back), Cat Dooley (breast), Chloe Marquis (Fly) and Aubrey Douds (Free) took first by a slim half of second, finishing 1:56.06 over Waukee’s 1:56.56. The Warriors battled back winning the 200 Free and 200 IM. The Rails refused to retreat, taking first in the 50 Free and diving, bringing the score to 37-41. After two more events, the meet was tied heading into the 500 Free – 55 points all. In the end, the meet came down to a “winner-take-all” 400 Free Relay, where the Rails won by over 5 seconds in a time of 3:51.20. As the team heads into week four of the season, all their relays are currently in the top 10 in the state. The team’s next competition is against Hoover at Lincoln High School on Sept. 4, 2018. And that also includes all three “B” relays too! Below are just a few of the many highlights from the meet. Rails 400 Free (Marquis, Zaugg, Douds, Snow) took first by over 6 seconds – 3:51.20, an untapered best! Below are a few photos from the meet. More can be found on the team’s photo website. Log-in is required. Access can be requested on the photo site. A link to the photo website can be found under Photo Websites Archive or in the small menu located at the top of the team website.